It’s a blustery late spring night in the Greenpoint section of Brooklyn, a place where both young moms and flashy skaters come to kill time. Caffeinated hipsters hunch over laptops, sipping chai lattes and Kombucha. Children play in the local park. Dudes shoot hoops on dull metal rims with no nets. 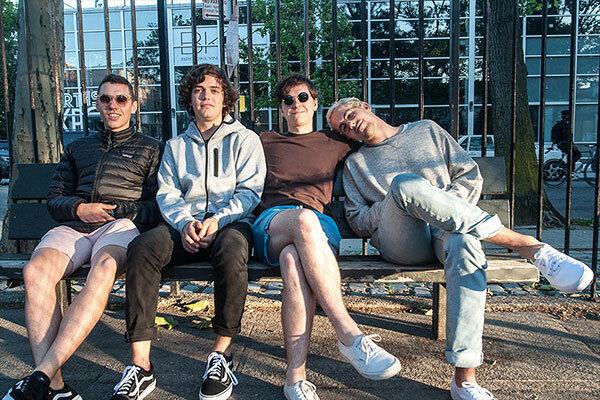 It’s the perfect setting for a group like BadBadNotGood, a Toronto jazz quartet that appeals equally to parents and long beards, those who like the genre’s traditional aspects, and those who prefer their music with a little more edge. 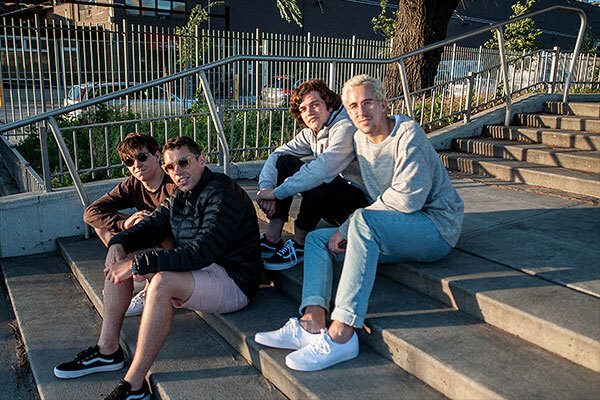 This evening, at the House of Vans on Franklin Street, the band is playing in front of a raucous crowd of onlookers—some passing through to the next food truck or beer stand, others gazing toward the stage to figure out exactly what it is they’re hearing. Leland Whitty’s searing saxophone wail gets immediate attention. During an interview earlier that day, Whitty was quiet; but here, BBNG’s newest member commands the stage with a volcanic performance, setting a breathless pace for his peers to follow. Drummer Alex Sowinski shouts out commands. Keyboardist Matthew Tavares rocks his head back and forth in a funk-induced trance. “Are you ready for some muthafuckin’ fun?! ?” Sowinski asks. The response is a loud roar. The group’s fusion of jazz, soul, and rock aggressively jolts the crowd. BBNG’s career started with a YouTube clip in 2011, in which the band was gathered in a small studio playing progressive jazz. This was back when the genre wasn’t popular, before rapper Kendrick Lamar used the sound to craft his magnum opus, To Pimp A Butterfly. The music they played felt remarkably sophisticated, considering their jokey name. Yeah, it was jazz, but not quite the traditional stuff. This was something else—something fresh and resonant, music that could appeal to both older jazz fans and the younger ones who want to bounce to trap beats. Even in their earliest days, it was clear the band was different. They liked MF DOOM and Odd Future, the eccentric L.A. rap collective fronted by lyricist/producer Tyler, the Creator. In what might’ve been a nod to Odd Future’s eccentricity, Sowinski wore a pig mask during live shows. There was nothing behind it, really, bassist Chester Hansen said at one point. It was just a cool-looking thing Sowinski decided to wear. Whatevs. They could handily cover any popular song, putting unique spins on hits by Gucci Mane, A Tribe Called Quest and Waka Flocka Flame. But while there was plenty to like about the trio of Sowinski, Hansen, and Tavares, it was still surprising when Tyler retweeted YouTube footage of the band recreating the Odd Future tracks. The shout-out caused the video to go viral. “It was crazy for sure,” Hansen says. “We put that and a couple other things up on the internet, then we went back to school. It was great.” After the first video gained traction, a friend of the band offered them a free recording session. They recorded their debut LP, BBNG—which featured covers of Wu-Tang Clan, Nas, and GangStarr—in three hours. Then, they uploaded another clip of repurposed Odd Future songs to YouTube, this time featuring Goblin standouts “Nightmare” and “Yonkers.” By October 2011, BBNG was performing with Tyler himself. In 2012, the band backed singer Frank Ocean at Coachella, the same year he released channel ORANGE to massive critical acclaim. Along the way, they opened for jazz/soul legend Roy Ayers at the NuJazz Festival, and played for tastemaker Gilles Peterson’s Worldwide Awards in London. From the outside looking in, you’d think BBNG would be huge stars by now. But up to this point, they’ve largely remained under the radar—a wildly popular band with a large cult following, largely devoid of mainstream attention. They remain just outside, even while their new album, IV, earned shoutouts from Gilles Peterson, Vice, and NPR. With Whitty on saxophone, IV finds the band stretching into new sonic terrain, far beyond the jazz standards they’ve played in years past. No longer do they rely on covers: the band’s 50-minute album is made up of originals, incorporating jazz elements and guest appearances by Future Islands frontman Sam Herring (“Time Moves Slow”), noted saxophonist Colin Stetson (“Confessions Pt II”), rising producer Kaytranada (“Lavender”) and Chicago rapper Mick Jenkins (“Hyssop of Love”). IV also arrives in a world that’s more open to jazz, one year after Lamar’s Butterfly and saxophonist Kamasi Washington’s three-hour LP, The Epic, shattered perceptions of what the music can and should sound like. IV speaks to people who grew up on Madlib’s woozy cosmic funk and J Dilla’s rap/soul hybrids. It’s akin to jazz pianist Robert Glasper who, for years, has blurred the lines between weird and traditional, crafting songs for jazz fans who like Radiohead, too. IV sounds nostalgic; the soul tracks feel pulled directly from the 1960s and ‘70s, giving them a decidedly evocative feel. 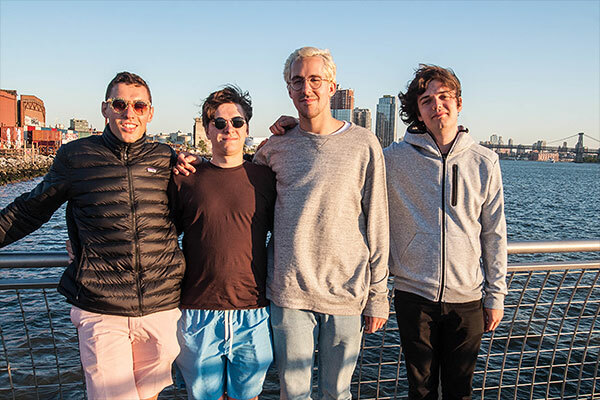 The members of BadBadNotGood met each other in 2010, when they were students in Humber College’s jazz program in Toronto. “We go to school,” Tavares once told Respect Magazine. “We don’t really like it.” Humber has more than a few standout graduates on its roster: Celebrated trumpeter Jonathan Challoner, who’s played with noted jazz acts John MacLeod and Terry Clarke; and singer Laila Biali—a formidable vocalist, who has recorded with and sang backup to Sting. Yet it’s safe to say the school hadn’t seen anything like BBNG. Once during a test piece, the band mixed an Odd Future track into its composition for class, and it landed with mixed results. That same approach would eventually make the band popular, but the instructors weren’t as enthusiastic. Despite that, Steve Bellamy, dean of Humber’s School of Creative and Performing Arts, applauds the band for staying true to their artistic vision. He salutes the nuance of BBNG’s work, and says the school encourages its students to blend genres. By 2015, BBNG recorded a full album with Wu-Tang rapper Ghostface Killah, a monumental feat for the young band. From there, BBNG has opened its sound to something not so intently focused on the rap/jazz hybrid, but more well-rounded and worldly. The music itself is tough to peg; IV could play just as well in smoky jazz lounges or amphitheaters, in confined spaces or outdoors, where the sounds can travel. On July 2, the group backed up MC/singer Yasiin Bey (formerly known as Mos Def), who performed his new song, “Arcade,” at the Cape Town International Jazz Festival in South Africa. And on Aug. 11, in what might be their biggest show to date, the band will open for the Robert Glasper Experiment and Herbie Hancock, both of whom have spent several years forging a path for the strain of progressive jazz BBNG now travels. Yet for BBNG, there’s no telling where they’re headed next. They say they’ve got a bunch of music recorded with Kaytranada, and some unfinished work with Tyler. They want to get their compositions out to more producers and have their beats featured on more mainstream projects. BBNG wants to influence the sound and feeling of music overall. This entry was written by Editorial, posted on July 11, 2016 at 7:08 am, filed under featured music and tagged Alex Sowinski, BadBadNotGood, Chester Hansen, Leland Whitty, Matthew Tavares. Bookmark the permalink. Follow any comments here with the RSS feed for this post. Post a comment or leave a trackback: Trackback URL.